I love using my time in the car wisely. I found that my life greatly improved once I discovered the power of podcasts along with audiobooks. Now instead of wasting countless hours stuck in Atlanta, GA traffic or while making long road trips, I maximize this time for self-improvement, entertainment, along with focused learning. I recently came across a good audiobook (also available in print or eBook) on jiu-jitsu that I thoroughly enjoyed. 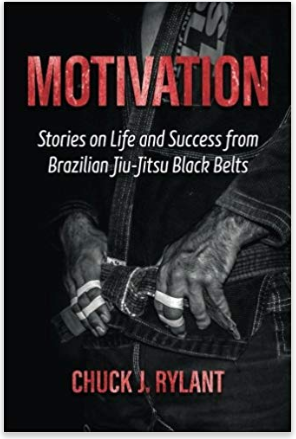 The book Motivation: Stories on Life and Success from Brazilian Jiu-Jitsu Black Belts by Chuck J. Rylant is a fun read (or listen as it is also available as an audiobook). It is a compilation of interviews that he did on a number of Brazilian Jiu-Jitsu black belts. Some of them are well known (but parts of their stories less known) while others are probably on practitioners you are less familiar with. What the reader gets to learn is that everybody has struggled in life. We all suffer. It’s just the type of struggles and how much we suffer may differ from one person to the next. But all of these black belts persevered in their own way, utilizing what they have learned from practicing the art in life and using what they have learned from life in Jiu-Jitsu. The author, Chuck J. Rylant is an author of multiple books. He’s an expert in personal finance (holding an MBA degree along with being a Certified Financial Planner “CFP”). Hey, my kind of guy! Rylant enjoys writing and sharing his talents in the areas of self-improvement, finance, business, and self-discovery (things I love as well). You can tell he has a genuine interest in jiu-jitsu and is a long-time practitioner. I have an Audible membership which allows me to download audiobooks onto my smartphone each month so I enjoyed this gem while traveling around town in my truck. The drive time went by very fast as each chapter was entertaining and insightful. I think you will enjoy this gem and was grateful for the author who shared his wisdom, insights and talents for the rest of the jiu-jitsu community.